We’ve learned from our friends at the Ravenna-Bryant Community Association that the new owner of the old Children’s Home Society of Washington site (3300 NE 65th Street) has offered the use of some of the old structures on the grounds to the Seattle Fire Department for “live fire” exercises. Three single-family homes on the site will become the training grounds for Seattle Fire recruits who are in their last weeks of training. These training exercises, which include “practice such as cutting holes in roofs, dragging fire hose lines inside,” and, in the case of the house at 6556 32nd Ave NE, actual fire, are scheduled for May 13-16. 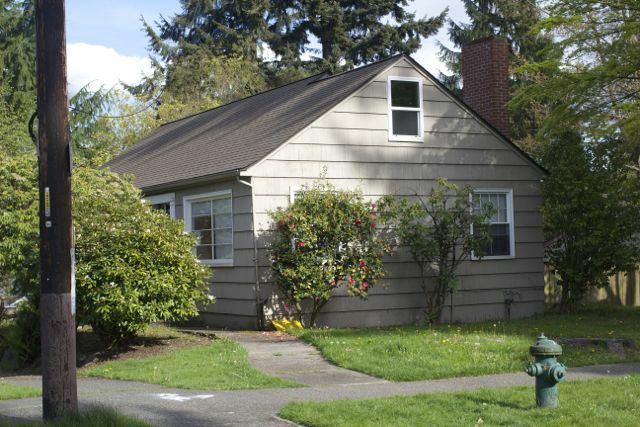 6556 32nd Avenue NE, one of three single-family homes on the north side of the old CHSW property. This environmental investigation has been completed and a certificate from a professional hazardous material contractor has been provided to the Seattle Fire Department evidencing that the homes are free of any such materials. With these certificates in hand, the homes are now being disconnected from the existing overhead and underground utilities consistent with the underlying demolition permits that the City has issued for these single family homes. The homes are scheduled to be disconnected on Monday, 4/28 with the work being completed by Seattle City Light, Garner Electric and BDZ Construction. After homes are selected and deemed safe for training exercise purposes, the neighborhood is notified and Seattle Fire Department staff begin preparing the buildings for the drills. During the first week of May, Captain Brian Maier will be making the rounds in the neighborhood around the site, informing residents of the upcoming training exercises. On Tuesday, May 6, Seattle Fire Department staff will begin the training preparations, which include delivering port-a-potties and prepping the training homes. Then, on the morning of the following Tuesday, May 13, the recruits arrive and drills begin. 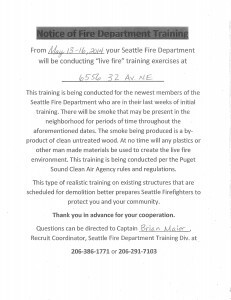 Neighbors with questions about the training exercises are asked to contact Captain Maier at 386-1771, or via email at allen.maier@seattle.gov. For more information on vacant buildings and the training opportunities they provide for Seattle Fire staff, visit the Seattle Fire Department’s Vacant Buildings Wanted! page. For more information on what is going up once the old CHSW buildings go down, the RBCA has a small update on Bryant Heights in their post about the SFD training exercises. 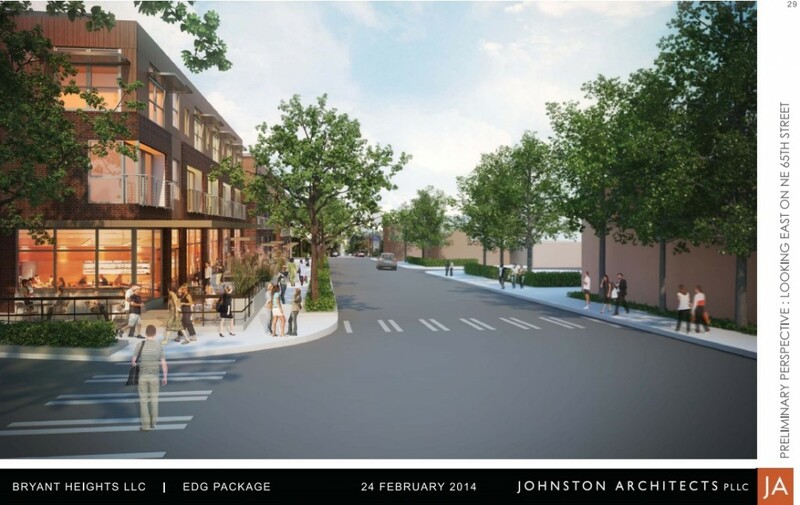 You can download the latest design plans for Bryant Heights here (35 MB PDF). And for more information on the Children’s Home Society of Washington’s long tenure at 3300 NE 65th Street, head over here to HistoryLink.org. UPDATE: The training has definitely started! This training fire, while no doubt a valuable exercise, is not good news for people in our neighborhood who are sensitive to pollution from wood smoke. Thanks for being the first source to notify us, and for providing Captain Maier’s contact information above. It’s our understanding that Captain Maier will be asking neighbors if they have health issues during his rounds before they prepare the site for the exercises. He’ll have more information for you in regards to your concerns. I’m impressed, I must say. Seldom do I come across a blog that’s equally educative and entertaining, and let me tell you, you have hit the nail on the head.